I know there are plenty of potager books, but this one, titled 'Potagers of Plenty' is an excellent read. Marylyn Abbott, photographs by Clay Perry, et al. 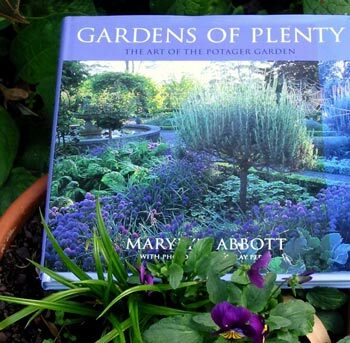 There are potagers from all around the world to enjoy in this beautiful book. It appeals to me because it includes examples from Australian gardens. And whatever can be done in Australia can certainly be done here in New Zealand! As a lapsed potager gardener - well, actually I failed totally - this book makes me feel a little guilty. But like all my favourite books it does give me ideas, and confidence. Sometimes I suspect that I'm just not meant to ever create a potager in my garden. For some reason I will never be a potager-person. My obese marrows and lettuce trees are conspiring against me again.